Deleting duplicate songs in iTunes , iPod, iPad or iPhone may look simple but having hundreds or thousands songs makes this task a little bit hard. If you have a large music collection, duplicate files are inevitable. 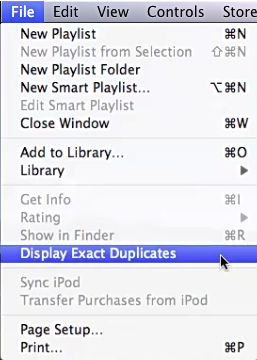 There is a built-in option in iTunes to delete duplicates in File->Display Exact Duplicates. As the name suggests this option will display the exact duplicates. This means that if your songs are tagged with different artist, album or song name this function will not help much. The other disadvantage is that it lists all files that have identical tags and you should manually review the results and remove the duplicates. While this is not an issue if you have 10-20 items it could be annoying if you have hundreds or thousands. In any case this is a helpful option provided by Apple, but it is hard to be applied on large collections. The best way to remove iTunes duplicates is to use a dedicated external application. The advantage in doing that is that such application can clean your entire music library and not just the iTunes duplicates. There are plenty of duplicate mp3 finder applications on the market and you should carefully choose the one that works properly and displays correct results. Using an unreliable tool may delete valuable data. A reliable tool should be capable of identifying duplicate songs in ant format regardless of the ID3 tags. This will help in cleaning files that you may have ripped from CD or downloaded from various sources and are not tagged with artist, album and song name. The key factor in choosing a duplicate mp3 finder is to evaluate its search algorithm. If a tool is not properly developed it may reveal false positives and lead to loss data. High performance – can scan tens of thousands duplicate audio files in less than a minute. You can remove duplicate music files from your entire computer in just several minutes and save gigabytes of valuable space on your iPod, iPad or iPhone. This entry was posted in Information and tagged Delete Duplicate Mp3, Delete Duplicates In iTunes, Delete Duplicates iPad, Delete Duplicates iPhone, Duplicate Audio Finder, Duplicate Mp3 Finder, Duplicate Music Finder, iPad Delete Duplicates, iPhone Delete Duplicates, iTunes Delete Duplicates, iTunes Remove Duplicates, Remove Duplicates In iTunes on February 14, 2013 by MindGems Support.